I’ve not posted an update on the Pythagorean for the English Premier League (EPL) for a while so the latest figures are below. In case you haven’t seen it before, my football Pythagorean is an adaptation of the baseball pythagorean that allows you to quickly estimate how many points a team would be expected to achieve on average based on the number of goals they have scored and conceded. It’s a pretty simple little equation but it is surprisingly accurate. Take a look at my previous blog posts here about it if you want to find out more about the theory behind it, how it was tested and what the equation itself actually looks like. Figure One below shows the difference between the actual points each Premier League team has achieved this season and how much my Pythagorean predicts they should have on average. For teams in green the difference is positive meaning they have more points than expected while those teams in red have less points than expected based on the number of goals they have scored and conceded. Once again Tottenham are way ahead of where they would be expected to be, with an astonishing 15 points extra. Either Spurs are doing something fantastically efficient this season or they are extremely lucky to be where they are in the league. Take those 15 points away and they drop down to 10th place just ahead of Stoke. This season has been a bit of a write off for Spurs compared with pre-season expectations but it could / should have been so much worse based on their Pythagorean. Down at the other end of the table Hull should probably be feeling quite pleased with themselves as they are looking a pretty safe bet to avoid relegation even with their Pythagorean of -5. 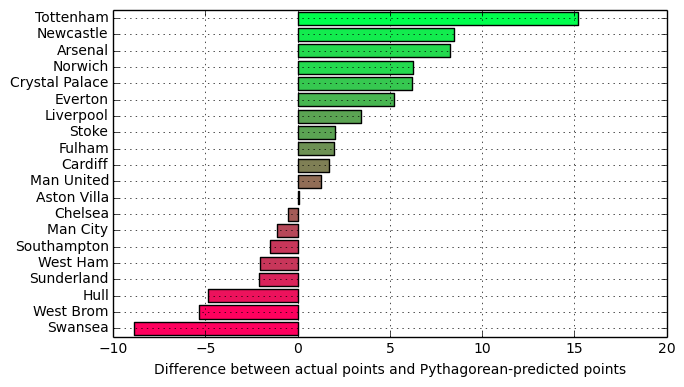 Poor Swansea though have the lowest Pythagorean in the league. On average teams with their goal record would expect to have achieved roughly nine more points than their current total. In fact if Swansea and Tottenham both had the average points their goals suggest then the Swans would actually be the higher placed of the two teams! Great blog and the EI index is very interesting. It seems that teams that overachieve according to their EI index are those that have suffered heavy defeats with a big goal margin (Tottenham losing 4-0, 4-0 and 6-0 to the top 3, Arsenal losing to them 6-3, 6-0 and 5-1; Norwich 7-0 and 5-1). Obviously, their expected points are negatively affected by these few heavy defeats. Wouldn’t it make sense to cap the margin of victory/defeat to 3 goals and re-calculate the EI?